It is an unforgettable time when you realize you want to spend the rest of your life with someone. The feelings are unforgettable… the moments are unforgettable… the proposal is unforgettable. Since 1985 Diamonds on Wabash has been delighted to play a part in helping customers with the unforgettable moment of choosing an engagement ring, because when you find “the one” there is nothing like it. Couples in Chicago create unforgettable moments at our Coast Diamond Retailer of the week, Diamonds on Wabash. You can’t go wrong with one of these Coast Diamond engagement rings. They embody all that is most unforgettable in engagement rings. Our most award-winning Coast Diamond engagement ring is unforgettable with a pear (teardrop) shaped diamond center stone. The pear-shaped engagement ring is for the hopeless romantic who is always true to herself. She will never forget the moment she lays eyes on this. To complete this Coast Diamond setting take a peek at pear-shaped diamond center stones available at Diamonds on Wabash. The glitter of a princess cut diamond engagement ring is unmatched. She will be unforgettable when wearing our Coast Diamond princess cut engagement ring. The tailored band of diamonds enhances the elegance of this truly unique engagement ring. Browse your options of princess cut center stones to complete this setting at Diamonds on Wabash. A round center stone surrounded by a cushion shaped halo of diamonds gives this Coast Diamond engagement ring subtle sophistication. Set in a brilliant band of diamonds and paired with the equally brilliant wedding band this ring will surely take her breath away. Start your round diamond center stone shopping at Diamonds on Wabash now. The refined lines of our Coast Diamond modern halo engagement ring are perfection. The split band encrusted in diamonds makes it modern… The setting of rose gold makes it timeless. Tell her how unforgettably glamorous she is when you present her with this stunning engagement ring. Find the perfect center stone to complete it at Diamonds on Wabash. Congratulations to Diamonds on Wabash of Chicago for creating unforgettable engagement ring shopping experiences and for being chosen as our Coast Diamond Retailer of the Week! The classic bride is timeless and elegant. A classic engagement ring is also timeless and elegant, oftentimes a masterpiece with the very best of design to last a lifetime and longer… The classic engagement ring can be passed down for generations. The place to go for your classic Coast Diamond engagement ring is Lautares Professional Jewelers in Eastern North Carolina. They have been serving generations of jewelry and fine gift lovers since 1912. With this kind of history in the engagement ring business they know classic and can help you find the classic Coast Diamond engagement ring of your dreams. We are excited to honor Lautares Professional Jewelers of Greenville, NC’s 105 years of service as our Coast Diamond Retailer of the Week. A classic engagement ring has a number of characteristics you can choose to include in your engagement ring. Pavé set diamonds – A six prong center stone setting – A diamond solitaire center stone – A halo design – Platinum. Our Coast Diamond engagement rings are completely customizable so you can choose the classic design you love and make it unique to you. Choosing the center stone for your favorite Coast Diamond classic engagement ring is an ideal way to create your dream engagement ring. Our most popular and award winning classic Coast Diamond Charisma Collection design is the 1 CT halo engagement ring (LC5410). Make it your own with an oval, pear, princess or round diamond center stone. Coast Diamond halo engagement ring (LC5410-OV) with an oval diamond center stone. Click image for details. The solitaire engagement ring is truly timeless. Passed down through the generations it is a classic design that can be customized over and over again. One of our favorites is the 1CT diamond solitaire engagement ring (LC10291) with a delicately braided diamond band. Coast Diamond solitaire engagement ring (LC10291) with a braided diamond band. Click image for details. A timeless engagement ring design that has it all, this cushion shaped halo engagement ring design (LC5256) has a cathedral setting with a surprise diamond on the side. Together with the diamond encrusted matching wedding band they are the perfect pair. The matching diamond band sits flush to complete the set. Congratulations to Lautares Professional Jewelers in Greenville, NC for being chosen as our Coast Diamond Retailer of the Week! Don’t forget to #showyourcoast on Instagram and share your story on our website. We can’t wait to hear from you! We very happy to celebrate the engagement of Arielle Geller, alongside Coast retailer D.Geller and Son!! Read the post below and check out the Coast ring chosen by Arielle. Congratulations to Chase and Arielle! It is the only thing you will wear everyday with everything, no matter the occasion. You are unique and you want your engagement ring to reflect your style. At Saxon’s Fine Jewelers in Bend, Oregon brides-to-be are choosing engagement rings with warm metals, unique diamond center stones and rows of diamonds. Couples are choosing Coast Diamond rings that show their individuality and we love it! In Central Oregon, you will find your unique Coast Diamond engagement ring at Saxon’s Fine Jewelers in Bend, OR our Coast Diamond Retailer of the Week! Uniquely YOU! Stack your Coast Diamond rose gold halo engagement ring with a twisting diamond band. The halo engagement ring is updated with a vibrant rose gold band in this Coast Diamond cushion shaped halo engagement ring (LC5381). To compliment this exquisite and elegant ring add a Coast Diamond band (or TWO) for a truly trending look. Coast Diamond cushion shaped halo engagement ring (LC5381) with a vibrant rose gold band. Our award winning Coast Diamond halo design (LC5410) is over-the-top gorgeous with an oval center stone. An oval shaped center stone elongates the finger and is a very popular choice in engagement ring style today. Coast Diamond oval halo engagement ring (LC5410-OV) with a radiant diamond band. The cushion shaped halo engagement ring is classic. This Coast Diamond cushion shaped halo (LC5312) is enhanced with three rows (0.48CT) of radiant diamonds. Stunning as an engagement ring, but also the perfect anniversary gift. Coast Diamond cushion shaped halo engagement ring (LC5312) with three rows (0.48CT) of diamonds on the band. Congratulations Saxon’s Fine Jewelers in Bend, OR! 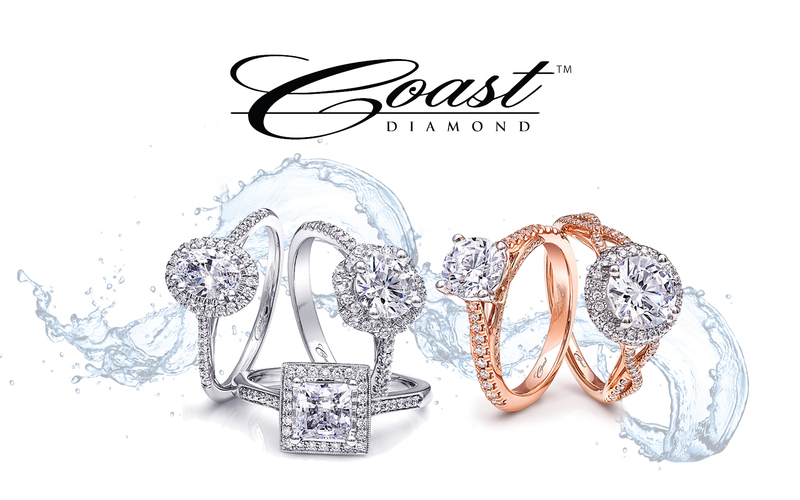 We are honored to call you our Coast Diamond Retailer of the Week. We cannot talk about Lufkin, TX without first mentioning the #Thundering13. The Little League All-Stars from Lufkin, Texas have been in the news for their fantastic showing in the 2017 Little League World Series. What a thrill it was to watch the top team from the United States in their first Little League showing! We feel all this excitement makes for the perfect opportunity to make baseball season complete and surprise the love of your life with a Coast Diamond engagement ring? We are certain you will find the ring that hits it out of the park at our Coast Diamond Retailer of the Week, Beard Fine Jewelers in Lufkin. The most envied engagement ring today is set in rose gold. A Coast Diamond solitaire diamond engagement ring (LC5388RG) set with a tapered rose gold band of petite diamonds is sure to warm her heart. The surprise diamond in the gallery of the ring leaves sparkle in every direction. The following Coast Diamond 1Ct halo engagement ring (LC5392) has hit it out of the park time and again. The split band of diamonds holds this grand ring snuggly on her finger. Complete the ring on the wedding day with the matching wedding band (WC5392) that is contoured for perfection. There is nothing like the tradition of baseball and its counterpart of engagement rings is the Coast Diamond six-prong solitaire engagement ring (LC5270). This classic ring is customizable for any shape or size center stone and any metal type, making your ring as unique as the love of your life. Congratulations the Lufkin Texas All-Stars and to Beard Fine Jewelers for being our Coast Diamond Retailer of the Week!